Talent points are the most versatile means of gaining benefits for all aspects of progression and strength. If you aim to be efficient, plan on resetting your talents and changing them to best fit your current situation fairly often. The cheapest means of getting a talent reset is purchasing with 90k guild coins. I would never suggest spending gems for resetting your talents, which means you should have a few of the resets tucked away at all times in the event of an emergency. Every player’s situation will be different depending on variables such as where their guild hive is located, which resource nodes are primary available, how often guild members help by sending resources, and how the player built their ratio of resource buildings on available building slots. Adjust your available talent points to meet your needs, if you read the tooltips this should be self explanatory. Construction and Research should be taken as priority for all players of any builds. Uh oh, your guild is under attack and you want to fight! It is inevitable you will find yourself in a situation where you need to make your army as strong as possible and send them to battle. Just like all pieces of advice, the talent points you want to choose in an event like this are going to be partly situational. Squad Health II is the hands down strongest talent for attacking and defending. Squad Defense II is the second strongest 50 points to spend. “Troop” Offense III should be maxed out fully before the II and I talents. Which “Offensive” (+attack damage) talents you choose, should be determined by your army composition and your enemy’s army composition. Hopefully, that information is available to you. Hi there, thanks for your Guide. We will send you your reward of 2,000 Gems within 24 hours. Nice guide although I would disagree with some of the things. You can always get enough resources from mining\harvesting etc.., monster fights and many other ways. This is just my point of view. However I do agree that you should be able to quickly switch on a military tree once you are you you want to do a good couple of attacks OR need to defend your castle. But that's not far in the game. 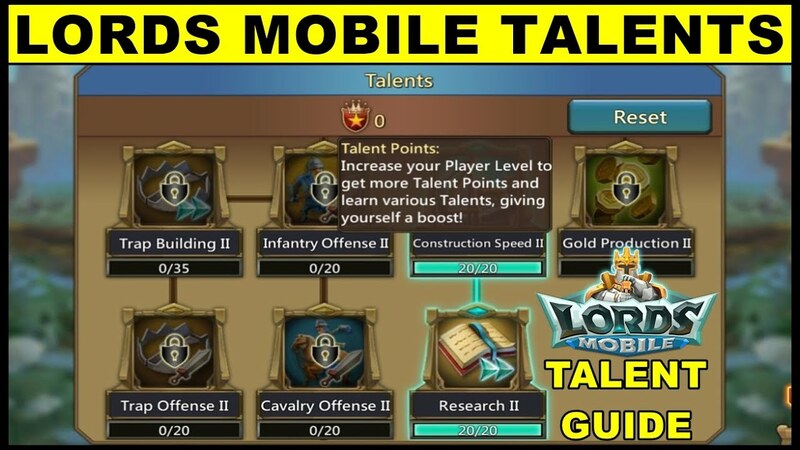 I came here to understand how Talent Points actually work in Lords Mobile. It is very elusive info that needs to be clarified, particularly in regard to the statement that they only work in a situation where your Leader is deployed. You can only deploy your Leader in one Army at a time, so are other armies that you are deploying at the same time covered or excluded from coverage? Worse yet - if your Leader is imprisoned you have no Talents at all. Finding the outcome of a change in Talents is a bit hazy at best. How do these Talent Points actually translate into percentage Boosts that can be witnessed here? The one thing I learned though, that cheers me, is that you can buy a Talent Reset for 90K Guild Coins rather than the 1K Gems that the Game offers them at - totally extortionate just to change Talents and you have to use 2 of them - one to change the other to revert - IGG at it's very worst!